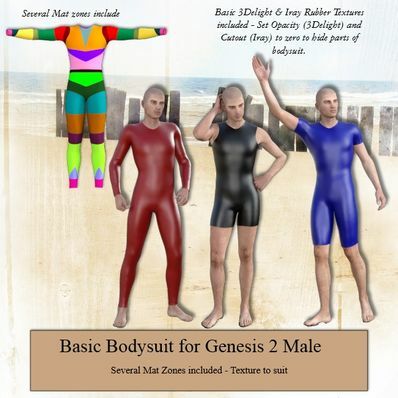 Basic Bodysuit for Genesis 2 Male for use in Daz Studio 4.8.
just what I needed. You are a lifesaver. Thanks so much for all your great work! Fantastic. It's impossible to find a plausible wetsuit/bodysuit for pretty much any Daz male models. This is great. Thanks! This looks very useful & versetile! Thank you! Than you so much....so many things can be done with this amazing suit!!! Phantastic - so many possibilities! The suit is also perfect for G3M. Thank you very much! Thanks Wendy. This is a great idea and very versatile. Oh, how wonderful to have all those Mat Zones and the rubber texture. Looks awesome! Can't wait to work with it! Thank you so much! Lots of uses for this! Thank you for continuing to support Genesis 2 ! !